A stylised flower on black. The design can be worked completely in half cross stitch although the model as illustrated used a variety of stitches. 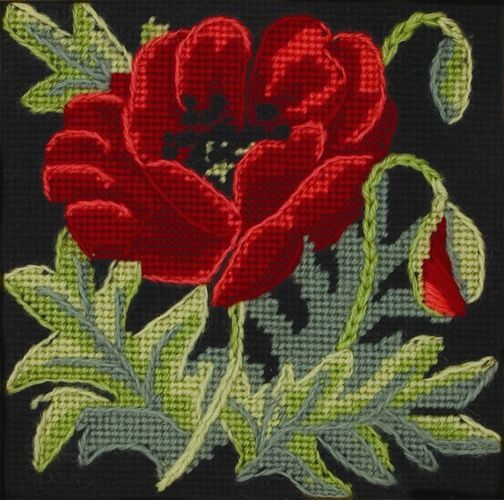 The poppy is stitched in half cross stitched and edged in stem stitch with french knots for the black stamens. The leaves are in half cross stitch with veins in stem stitch the bud is in satin stitch outlined in stem stitch and the stems are in stem stitch with the black background in half cross stitch. Stitch diagrams are included. The 100% cotton canvas is printed with the design in full colour.